IP communications across multiple, sometimes untrusted, networks needs to be normalized, managed and secured. As part of the most cost-effective, easiest to manage line of Session Border Controllers on the market, Sangoma's NetBorder Carrier SBC provides full-featured, carrier-class security and interconnection at the edge of carrier networks. 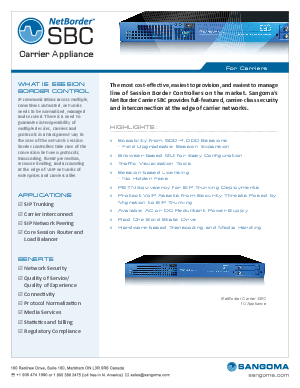 This data sheet provides details about The NetBorder Carrier SBC features and capabilities that include protocol conversion, transcoding, threat prevention, resource limiting, and accounting at the edge of VoIP network.